Mimoco is happy to help anyone who wishes that flash drives had a bit more whimsy. The maker of the Mimobots character-based flash drives were at Macworld | iWorld to show off their creations and introduce their new Legends line. According to a company representative, the Legends line will be based on real people, with Albert Einstein the first to be honored. With the cap on the drive, Einstein has that familiar stoic look on his face, but remove the cap and you’ll find a variation of Arthur Sasse’s famous photo. Mimoco wouldn’t say who else will be Mimoboted, but they are confident the public will like who they picked. 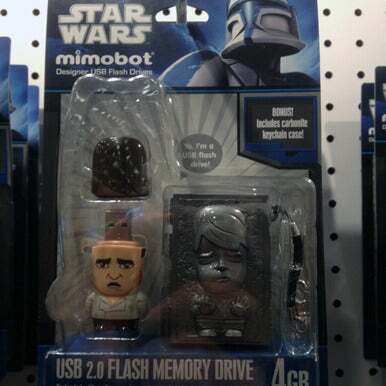 Mimoco also sells flash drives based on original characters and others designed by independent artists, but their most popular drives come from their Popular Culture line. Characters from the DC Comics, Star Wars, Sanrio, and Transformers universes populate the line. The best ones? “Hans” down, it’s the Star Wars collection. The Han Solo drive comes with its own carbonite carrying case, and the caps on the Boba Fett and Darth Vader drives act as helmets, revealing a surprise underneath, which I won’t spoil. To further distinguish them from other drives, Mimobots come with icons, avatars, and screensavers specific to each character. 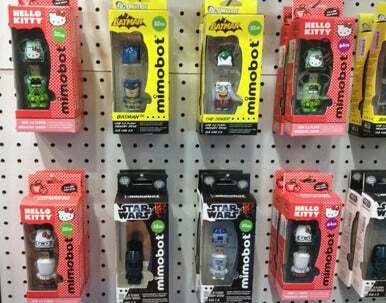 Mimobots come in various capacities, from 2GB to 64GB, and range in price from $23 to $120.